With the economy not being at its best at the moment, it makes perfect sense if you were to do your best to save up wherever and whenever you can, and Cisco has stepped in to help you do just that with their very own coin collector and counter known as the Digi-Piggy. Yup, this is no porcelain porker that needs to be thrown onto the ground or struck with a hammer in order to get to the goodies inside when you need a little bit extra dough at that moment in time. The pig’s snout itself will feature an innovative digital readout, where Digi-Piggy is alert enough to count all American coins while making sure that a running total is kept, regardless of the order or the value of the coins inserted. Sounds like the perfect tool for little ones to start learning on the value of money as well as instilling such a discipline in their lives. Of course, college students might also pick up a Digi-Piggy for themselves since it is the perfect fodder for those who pay plenty of visits to the nearest Laundromat or are a huge fan of vending machines that require coins. Of course, those who frequent arcades or have to feed parking meters on a regular basis would do well to bring home the Digi-Piggy. So far, we do know that Cisco intends for the Digi-Piggy to hit the market sometime in the third quarter of the year, where it will be available via major chains including Kohl’s, Wal-Mart, Bed Bath and Beyond and others. 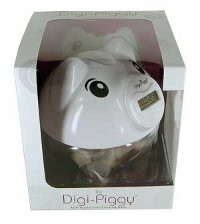 Made out of highly-durable plastic, the Digi-Piggy is destined for longevity, functionality and safety. Accessing your savings is a snap with its twist-off lid, and too bad we do not know just how much something like this will cost just yet. As long as it helps us save money, we guess, and hopefully the Return On Investment will happen sooner rather than later.